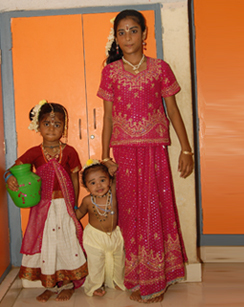 Nethaji Mercy Home for Orphan and Destitute children believes that God is one! He has many names such as Rama, Jesus and Allah. 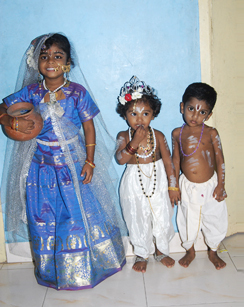 They has been celebrating krishana Jayanthi, Deepavali, and Moharam. The children of Nethaji Mercy Home for Orphan and Destitute also celebrated Christmas Eve wonderfully. The children were delighted in meeting the Santa Claus. And the children received the Christmas gifts from the Santa Claus. 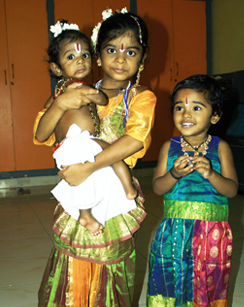 "Krishna Jayathi Celebration Children Greeted Lord Krishna with Mrs.Kala during Krishna Jayanthi Celebration"